Lazarus provisionally added, and lessons and collects provisionally revised at General Convention 2009. 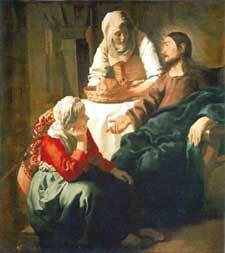 Mary and Martha lived with their brother Lazarus at Bethany, a village not far from Jerusalem. They are mentioned in several episodes in the Gospels. On one occasion, when Jesus and His disciples were their guests (Luke 10:38-42), Mary sat at Jesus' feet and listened to Him while her sister Martha busied herself with preparing food and waiting on the guests, and when Martha complained, Jesus said that Mary had chosen the better part. On the basis of these incidents, many Christian writers have seen Mary as representing Contemplation (prayer and devotion), and Martha as representing Action (good works, helping others); or love of God and love of neighbor respectively. They see the same symbolism also in Leah and Rachel, the daughters of Laban (Genesis 29 and 35). Leah was dim of sight, but had many children. Rachel had few children, but one of them saved the whole family from destruction. Leah represents Action, which is near-sighted and cannot penetrate very far into the mysteries of God, but produces many worth-while results. Contemplation has fewer results, but one of those results is Faith, without which it is impossible to please God." (Hebrews 11:6) Yet, there is a sense in which Action comes first -- "If a man love not his brother, whom he hath seen, how shall he love God, whom he hath not seen?" (1 John 4:20) So it is that Leah must be wed before Rachel. On some calendars, Lazarus is commemorated together with his sisters, on others his resurrection is remembered separately on 17 December.